The soundtrack to the next big run! On day 6 of last year's big run I received an email from one Alan Millen (pictured left) entitled "The Exiles and their Toon Army tunes could be the soundtrack for your run". 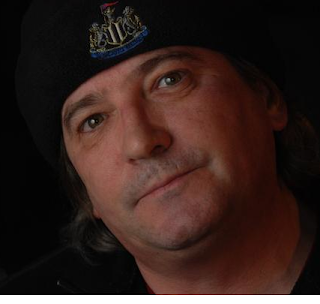 I didn't know this at the time but Alan was one half of a band called The Exiles. I later found out that Tim Readman (pictured below right) was the other half. As I understand it, Alan (based in Switzerland) is the lyricist and Tim (based in Canada) does the instruments and that. Anyhow, they wanted to send me two of their CDs to listen to when I was running the 874 miles to Lands End. "Brilliant", I thought and I had the CDs in time for the second half of the big run. I listened to both of their albums a few times in the remaining weeks on the run but it wasn't until later on the many school runs in the car that Jack and I really started to get hooked on their music. We found that, the lyrics as well as the melody of so many of their songs were so catchy and once you know the words you just have to sing along and tap your feet. It wasn't unusual for us to be driving through Rowlands Gill on a frosty morning singing "Wor Jackie's the greatest, that canny Geordie son, he scored the goals that won the cup in 1951....". "Can we listen to that one again Dad?" was Jack's usual response after each song. You might think I'm making this up but I promise you I'm not! A few weeks ago when I was riding my bike home (and saving another fiver towards the 2011 Tour Fund as a result!) I was listening to The Exiles' 2nd album - And 50,000 in the stands. I think the song was "My Friend Tim, thinks he's Jinky Jim" and I was just about to join the Derwent Walk for the final 9.5 miles home. All of a sudden I had a flash of inspiration! I thought it would be an amazing idea if I could get the Exiles to write and record a song for the next big run. My initial idea was for it to be used in the regular videos and podcasts I intend to send back from the USA in 2011. "Why stop there" I thought! 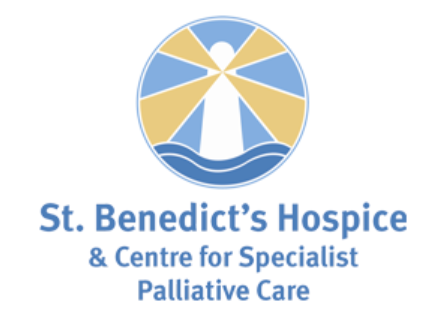 We could make this a charity song, sell it as a download and in the shops and proceeds could be split between The Children's Foundation and St Benedict's Hospice. Genius! Not just a Civil Servant's son born in Jesmond, I'm a blooming genius! As soon as I reached home that night, I was on to Tim and Alan via email. Just hours later, I got a response from them both. It was no surprise that they were on board straight away and thought it was a "fascinating" idea. I've since supplied them with a few "inspirational" details and the plan is for them to take them away for a few months and come up with a charity song to be used as the soundtrack for USA 2011. As an old friend once said "You just couldn't make it up"! Watch this space for further developments on the song as I get them. For further information on The Exiles to to listen to a few tracks, check out their myspace page here. Why not buy/download their CDs! They are even on iTunes. That's canny impressive! I'm extremely grateful for their help. I've not told them this, but I have visions of them performing the song live on stage at the Fed Brewery at the cheque presentation evening in October 2011. Now that would be "Domino to Danny"! You'll have to read their myspace blog to find out what that means! One small step for mankind, one giant leap for Geordiekind! I've been trying to determine how many people have actually managed to run across the USA. Tonight, I stumbled upon a brilliant website - www.seejohnrun.com which has very detailed info about everyone who has ever managed the mammoth distance. Now the stats on that website really put things into perspective! So far, 184 people have been successful since the records began in 1909. Only 14 of them are British and as far as I can tell none of them are from the North East of England. 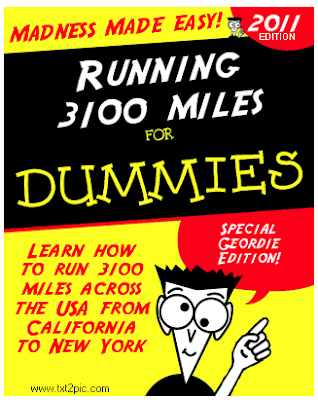 This could be history in the making as I attempt to become the first Geordie to run across the USA. I was amazed to find that only 7 British people have ran the distance since I was born in 1971. Well I've failed to save this week's training schedule. But I've got a good excuse. I've got my first cold (aka Man Flu) in over 2 years! The symptoms are a high temperature, a banging headache and generally feeling sorry for myself. I thought something was on the cards like this when I couldn't get out of bed to train earlier in the week. It's just not like me to back out of any training. I doubt I'll be cycling in to work tomorrow morning as planned, but you never know. Anyway, enough of feeling like I've got the plague! There have been 2 bits of good news this week. 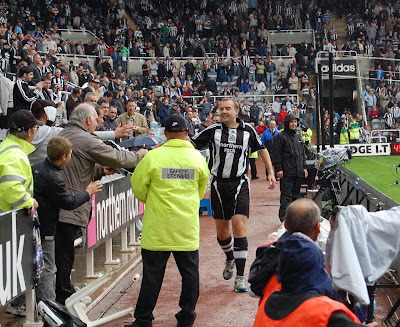 Firstly, the GEORDIE RUNNING ACROSS THE USA group on Facebook, now has 215 members! Thanks to everyone who has joined and has told their friends about it. At this stage it's good to know there are so many people interested in the next big run. That number, together with the steady stream of website hits, may be enough to attract corporate sponsors in the future. You never know! I'll reveal the second bit of good news on Wednesday! It's a cracker so be sure to check back then. Hopefully, I'll have gotten rid of this black death like man flu by then. Determined to rescue this week's training schedule, I put in a cracking little shift yesterday. First off, it was a 17 mile bike ride into work (£5 into the Tour Fund as a result!). Then at lunchtime, I managed an 8.4 mile run around the Havannah Nature Reserve with Carlton, Jeff and Carl. I saved the best till last however with a PB time for the 17 mile bike ride home (And another £5 into the Tour Fund coffers). All in all it was a good day's exercise with approx 4,200 calories burned! I followed that up with a good boxercise class today with sparring partner Simon and I intend to put in a good effort for tomorrow's spinning class. If I manage to get a couple of runs in at the weekend I'll consider this week's training schedule saved. Then it's time to start all over again next week! A disappointing response to a massive week of exercise. Last week I cycled 68 miles, ran 26.2 miles, had 3 spinning and 2 boxercise classes. Within the strategy of "no rest, no recovery", I expected another big week this week. However, things got off to a poor start on Monday. Try as I might, I just couldn't get out of bed in time to cycle in to work. Not only that, but the same thing happened this morning. What makes matters worse is the fact that the Tour Fund does not get the £20 I would have saved in petrol. It's not too late to rescue the week and in the grand scheme of things it's not that important as I did make it to a boxercise class today (and nearly passed out!). What I am mindful of though, is not letting standards slip. This time next year I should be running 110 miles a week. It would be a disaster, then, if I missed a couple of days of running. I simply must continue the habit of sticking to my training schedule. I've done really well so far in 2008. Let's see how I can respond during the remaining 5 days of the week. 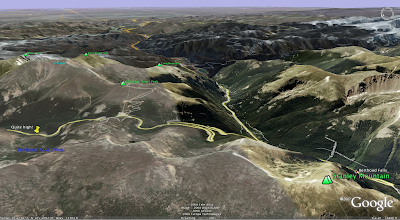 I've been looking at various points on the USA 2011 route recently using Google Earth. This part of the run, in Colorado, seems to be the highest point on the entire run at 11,300 ft! Given that the highest altitude I've ever ran at is 1750ft, I really do wonder what effect this particular stretch will have on me. 2009/2010/2011 training plan starting to take shape! One question I'm regularly asked (by myself usually!) is how on earth do you train to run across a country as big as the United States of America. Well the answer is certainly not a scientific one! 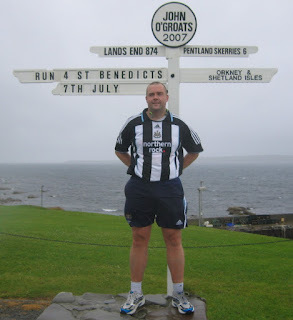 I never really had that much of an idea when I trained to run the 874 miles from John O'Groats to Lands End last year. I worked on the simple principle of taking the total weekly mileage and trying to run 1/3 of it every week during training. With hindsight, that strategy, together with the variety of terrain and elevation I covered worked really well and helped achieve the ultimate goal. I've been trying to apply the same kind of principle to the next big run's training plan. Oh and then make things a bit more difficult and testing! I'll be thankful for it later I'm sure! My initial thoughts are to run approx. 220 miles a week on the next big run. My gut feeling is that trying to run 1/3 of that distance in training each week is not quite enough. I think the target should be to run 1/2 of that distance each week! Now, like me when I did the sums, just take a moment to think about that. This means, that at the peak of this training plan, I'll be running 110 miles per week. 110 miles per week on top of work, family life and watching the Toon play! That kind of mileage is going to take some building up to, so the aim is to to get up to that level of training by July 2009. I feel that, once I start putting down milestones, such as this, that it is a case of just filling in the blanks between now and then. That's a fair few blanks mind! I've made a great start to training this year. 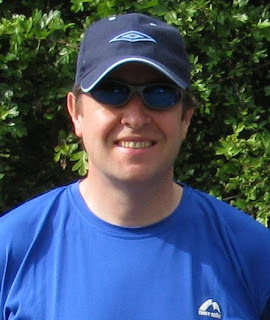 The aim for 2008 has always been to get myself ready to start training in 2009. Everything is going very much to plan. This is just the training before the proper training starts! Somehow, in 2009, 2010 and 2011 I've got to become like one of the runners I've looked up to for a long time now. Like a Jimmy Bell, a Patrick Aynsley-Smythe and dare I say it even a Jackson Williams! 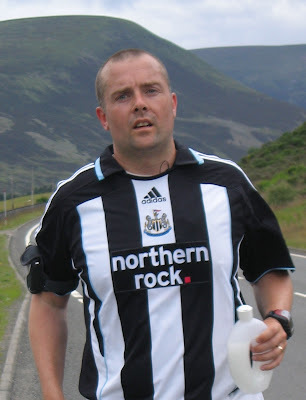 Somehow, I've got to get from over-eating Geordie to a finely tuned, ultra distance running Geordie! Now that's some tall order! In the meantime, I've just got to keep on keeping on doing what I'm doing. That is, enjoying a balanced mix of exercise in 2008 and getting used to having no rest and no recovery! I'll be building up the running to 50 miles a week by the end of the year (as well as all of the gym classes and cycling). 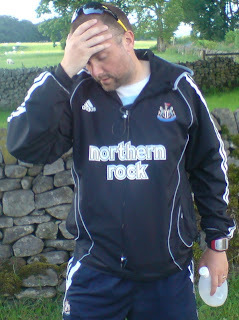 Then, if all goes to plan, I'll be running 110 miles per week by July 2009. I'll be looking to sustain this for the following 22 months, right up until April 2011. That is a massive target to aim for! Absolutely massive! It sounds pretty straight forward when I write about it! It's a good job I'm one for putting words into action. It's quite difficult sometimes to gauge the outside interest in this run and the various ramblings that go with it. At the height of last year's run I was getting 1000's of hits on this website (and of course £1000's in sponsorship for St Benedict's Hospice!). I'm still getting between 50-100 hits per day which is great! 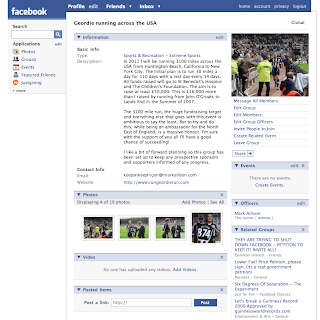 What is really pleasing though, is the number of people joining the Geordie running across the USA group on Facebook. Thanks to a few good folk spreading the word, the number of members is up to 101! That group, just like the planning for this run, is in it's infancy. It's great to know that there's at least 101 people out there taking an interest in my efforts! It's hard to believe that exactly a year has passed since Katy, Jack and I were at the start line in a very rainy and windy John O'Groats. 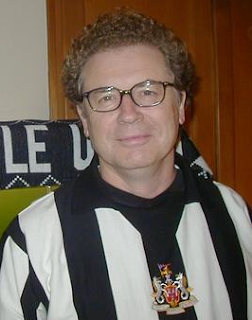 On July 7th 2007, the fund had just tipped over £9,000 thanks to the publicity from the lads at nufc.com. I could never have dreamed that an additional £25,000 would be added to that total. However, it was easy enough to dream of reaching Lands End. Not for one moment did I think I wouldn't get to the finish line some 36 days later. The highs and lows of those 36 days have been well documented. I've got a feeling I'll be reliving most of them in my mind's eye between now and August 12th. In the meantime, I've got a 17 mile bike ride in to work tomorrow at 6 am. I'll be following this up with a quick 5 mile run up to Newcastle Race Course with Michael Dunn at lunch time. Finally, I'll be making the 17 mile journey back home on my bike after work. I'll be doing my best not to stop at the Chippy in Rowlands Gill. That show of will power will be the hardest part of the day! And don't forget! The 2 bike rides mean that I'll be adding a tenner to the 2011 Tour Fund. Every little helps! I've just managed to register the domain name rungeordierun.com. It's got a better ring to it than markallison.com. It should hopefully help attract a few new visitors over the next 3 years and give the whole event an immediate sense of association with the North East of England. Over the next few weeks I'll be working on a snazzy new header for the blog. Watch this space! Also look out for a new links section at the right hand side of the page. I'll be including quick links to media articles and such like over the coming 3 years as I attempt to thrust this event into the spotlight. There is definite momentum gathering for the USA 2011 run both on and off the track. There are busy yet exciting times ahead! USA 2011 - Time to start saving! For the past month I've been thinking of ways of how I can fund the up and coming big run across the USA. As per usual, every penny of sponsorship will be passed on to the charities. So the "Tour Fund" will come out of my own pocket once again. My missus, Katy, got the Tour Fund underway with a generous contribution but that still leaves me with the prospect of finding a few more quid between now and 2011! At this moment in time, I'm uncertain as to how much the Tour Fund needs to be. I'm aiming for £15,000 though. If, I can subsequently raise £50,000 for charity by doing the actual run it will be money well spent. If I don't manage to raise anywhere near that amount but successfully complete the 3100 mile trip then it will still be money well spent. In June, I started cycling to and from work on various days. It's a 17 mile trip and is an ideal opportunity to not only boost my fitness but to bank the saved petrol money (£5 per journey). This plan has got off to a great start, as for the 3 weeks I cycled in June, I put £55 towards the Tour Fund. Although it's uncertain where I'll be working over the next 3 years, I'm aiming to raise £3,000 of the Tour Fund by replacing car journeys with bike rides. The Tour Fund wins, my fitness wins, the environment wins, everyone wins! I'll be getting my thinking cap on over the coming weeks with some more ideas to boost the Tour Fund. Watch this space! People's generosity never ceases to amaze me! The Pennine Challenge fund has nudged the all time total raised to just short of £50,000! Upon seeing this, one of the running team, Carlton Fletcher (pictured), put his hand in his pocket for The Children's Foundation and promptly got the all time total raised to £50,000!!!! What an unbelievable milestone! As I said yesterday, there are so many people to thank for helping get the amount to £50,000. Of course, the latest set of folk are the Pennine Challenge Team and all of this year's sponsors. Here's to the next £50,000! Those kind folk at the BBC Tyne website have posted an updated article about the Pennine Challenge. It can be viewed here. This year's total for The Children's Foundation currently stands at £1110! We are aiming to present the cheque in August. It's nice to say that we have exceeded the original target of £1,000. I have taken the liberty of updating the "Amounts raised over the years" total on the right hand side of this page. It is just a little bit short of £50,000!!! When I think back, there have been so many generous people involved in contributing to that total. And just like the Pennine Challange Team this year, there are so many people responsible for getting sponsored and helping to raise that amount. I couldn't have done it on my own! Steven - He WILL be back!!! Young Steven Moore (left) was seen hobbling and limping around work today. With a boozing holiday abroad to look forward to next week, it seems that he won't be able to put on much of a show on the dance floor. Steven will see a physio and have an MRI scan as soon as possible to fully assess the damage and plan his rehabilitation. Steven commented earlier today "I should be in a lot more pain than I am given last night's diagnosis". I think the fact that he was injured "in the line of duty" and "for a good cause" is making his immediate lack of mobility easier for him to accept. Just like fellow charity hero Michael Dunn (right) last year, there'll be a long road to recovery but I suspect we haven't seen the last of Steven on the fundraising circuit. As regular readers know, Michael sustained a similar injury 12 months ago on the same route. Knee surgery was performed only 6 weeks ago and against all odds he was able to join the 2008 Pennine Challenge team and do his bit for the cause. Once all funds have been collected, I'll be hoping to arrange a cheque presentation to the Children's Foundation. I can think of no better personnel to do the honours than young Steven representing the runners and Michael representing the cyclists.